Visually, the pale mousse on top of the dark chocolate cake reminds me of the froth that rises to the top of a freshly poured pint. Any stout can be used, but I chose Fort Collins Double Chocolate Stout because it's already a little sweet and has coffee-and-cream undertones. 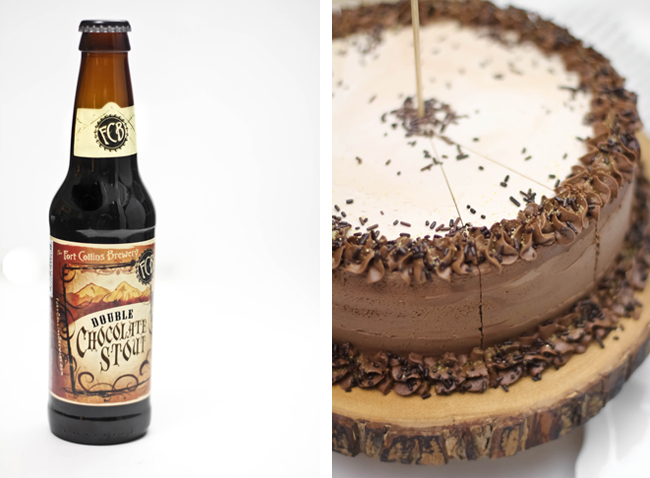 I think it'll be a lot of fun to experiment with other kinds of stout in this cake, so don't be afraid to get creative! The cake batter portion of this recipe makes a little more than a standard 9-inch cake pan can hold, so I suggest employing the use of a spring-form pan with tall sides -at least 9x3-inch. Or, you can divide the batter between two standard 9-inch cake pans and stack both layers on the bottom. The cake layers will need to be leveled with a serrated knife so the mousse can lay flat on top. Sprinkle gelatin over 2 tablespoons stout in a small saucepan. Let stand for 1 minute. Whisk in egg yolks and sugar. Whisk in milk and 1/4 cup chocolate stout. Cook over medium heat, whisking constantly. Mixture will thicken after 5 minutes or so. When done, it should be thick enough to coat the back of a spoon. Stir in chopped white chocolate and blend until chocolate has melted and mixture is well combined. Let cool. Whip cream until stiff peaks form. Gently fold whipped chocolate mixture into the whipped cream. Pour into prepared spring-form pan and smooth the top with a rubber spatula. Place in freezer for a few hours or until mousse is frozen solid. Preheat oven to 350 F. Grease and line a 9x3-inch spring-form pan with parchment. Be sure to use a pan with deep edges, this recipe makes slightly more batter than one standard pan can hold. Combine stout and butter in a large saucepan. Sift in cocoa powder and whisk to combine. Let cool slightly. Whisk flour, sugar, baking soda and salt in a large bowl to blend; set aside. Whisk eggs and sour cream into the cocoa/stout mixture. Pour in flour and mix with an electric hand mixer until well combined. Mixture will be thick. Pour batter into prepared pan and bake for 35-45 minutes, or until a toothpick tester comes out clean. Let cake cool in pan for 10 minutes then turn out and let cool completely on a wire rack. Level top with a serrated knife or cake leveler. When stout cake is completely cooled, remove frozen mousse from freezer and run a knife around the top edge. Run a dish towel under hot water and wring out slightly; press hot towel around the edge of the pan for 1 minute so mousse will release easily. Remove spring-form collar. Turn frozen mousse out onto the top of the stout cake. Refrigerate until ready to frost. Combine butter, confectioners’ sugar and 2 tablespoons cocoa in the bowl of a stand mixer. Beat on low until just combined, and then add chocolate stout. Beat until light and fluffy. If mixture is too thick to spread, add milk or cream 1 tablespoon at a time until consistency is reached. Frosting should be a pale chocolate color. Remove 1/3 portion of frosting from the bowl and coat the top of the cake. Beat additional 1/4 cup of cocoa into the remaining frosting until a consistent dark cocoa color is achieved. Beat in milk or cream 1 tablespoon at a time if mixture is too thick to spread or pipe. Transfer half the chocolate icing to a piping bag fitted with a large star tip. Frost the sides of the cake with the remaining frosting. Pipe stars around to top and bottom edge of the cake. Sprinkle with chocolate jimmies. Keep cake refrigerated. Serve slices cold or at room temperature. Cover the top first, then add more cocoa to the remaining frosting and cover the sides of the cake. 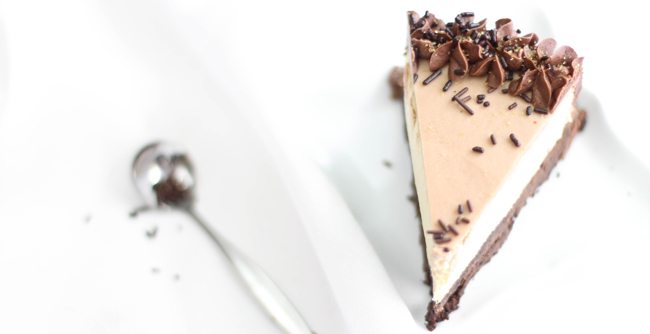 Mousse cake are my favorite type of cake. So soft and fluffy. If i do not have chocolate stout, could i use another chocolate flavored liquor? Irresistible! That cake must taste absolutely divine. What a combo! 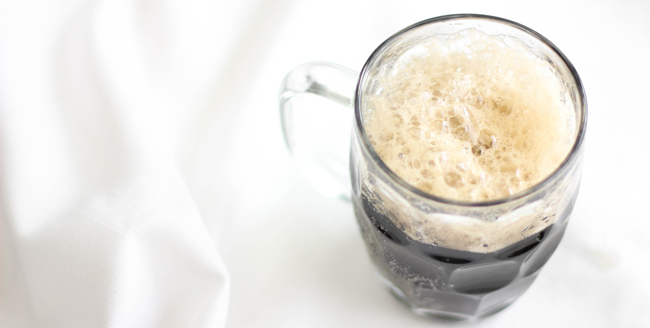 Even if you don't like beer, don't discount this recipe, people! I NEVER drink beer but love it when combined with chocolate in desserts. Your creativity and ability to make things turn out EXACTLY as you envision blows me away. This sounds and looks so so fabulous!! Mmmm, this is going on my list. Looks delicious! Is it neccesary to freeze the mousse portion? I really want to use this recipe in silicon tea cups that I have. OH my this looks amazing. Pinning this to try for sure! My husband is a craft beer nut and would flip over this. I think it'll have to become his birthday cake! @Heather - I got the stand at Costplus World Market during Christmas. They may still have them! I miss you too friend! I have something for you and mini that I hope to get in the mailbox soon. xoxo! @Nicole - the mousse is frozen so it can be easily transferred to the top of the cake. If you're serving in teacups, then you could just pour the mousse in and refrigerate. It'll set up nicely. What a perfectly elegant St. Paddy's Day cake. Sweet heavens this is gorgeous! Awesome!! This is exactly what I needed for my birthday dessert! All I can say is "Wow!" Well, and "I really want a piece of that cake." I don't think this cake could be any more perfect. And your pictures are adorable! I love how your brain works!This has got to be the most amazing mousse cake EVER!!! Beautiful! So glad you were able to work out the details to create this stunning cake. This cake is so lovely and elegant! 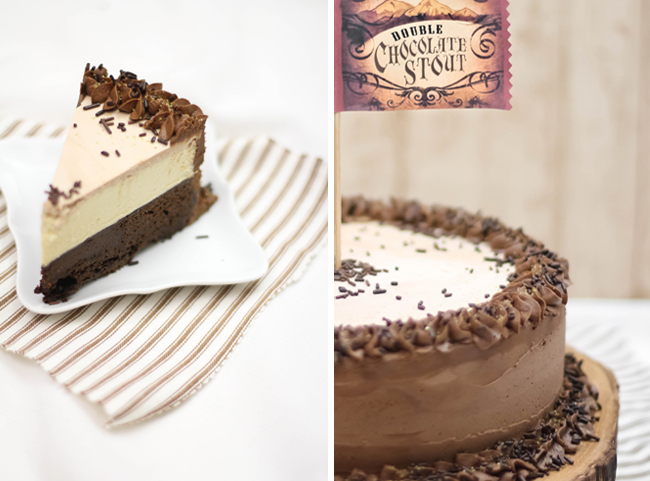 The combination of stout and chocolate is perfectly matched. Beautiful work! Your pictures are always fantastic! This is a beautiful looking dessert. Just ordered your book from amazon.com!! Yay for Fort Collins Brewery! For a small town with over 20 breweries, FCB is one of the best. They have a pomegranate wheat that is awesome for baking bread with. OMG this cake... it looks seriously incredible! Can I please move in with you? You`re right about the two colors of the cake! It is visually appealing for sure! The chocolate stout combo sounds amazing Heather! Fantastic idea...I have some chocolate stout that we need to use for something. Neither my husband or I like it for more than a few sips! Made this cake this weekend. It was fantastic!! What kind of knife did you use to slice the mousse? I've never seen a slice this smooth even from Bon Appetit, Cook's Illustrated, Saveur or Martha Stewart Living. Very elegant looking cake! I didn't use a special knife. Just a regular, non-serrated cake knife. The mousse layer has gelatin as a stabilizer, so it slices very neatly. I made this cake for my husband's step-dad's birthday...and it was devoured. My MIL used to teach cake decorating and taught me a few years ago before she retired. She asked me to make his cake for the surprise party. So I was a little nervous, but everyone loved it and there wasn't a piece left. Awesome recipe. I love stouts so this immediately caught my attention. I just made the cake this weekend and it turned out great. One question though, I am very inexperienced at baking, how can i make the frosting less sweet/rich? I did use cream to thin it out, would milk have made a difference? Thanks! Laurel Creates - I also used Youngs, untasted. I didn't mind it, but if you ever get the chance, try Harpoon Chocolate Stout. It's winter seasonal and a fairly small brewery (out of Boston/New England) but it's a lot smoother and than Youngs and I think it would be perfect for this recipe. The cake lookes divine! 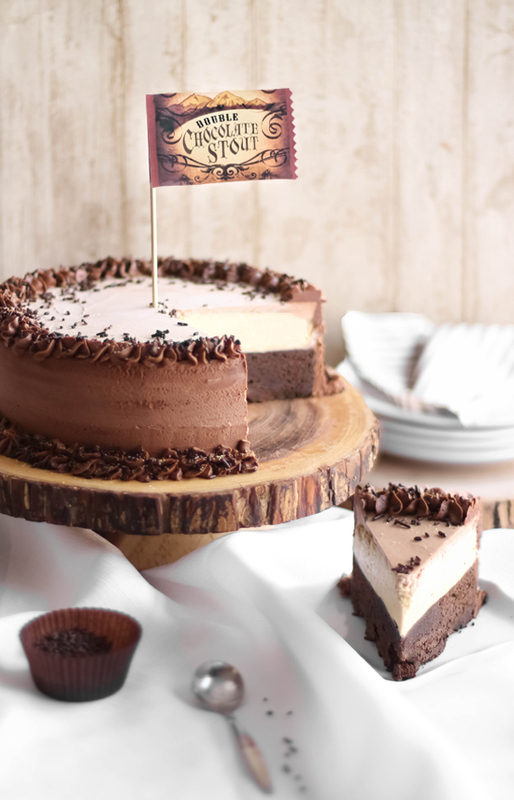 The wooden cake plate compliments the Double Chocolate Stout Mousse Cake perfectly and I am sure any chocolate cake also would look amazing on it. I'd really love to know where you purchased it from. Heather, I have to thank you for these recipes! For my husband's birthday last weekend, I made the chocolate stout cake and mousse, and used the whiskey pastry cream from your Seven Sins Chocolate Cake as a filling between layers (there were 3 or 4). I topped it all with the milk chocolate marshmallow frosting and chocolate drizzle (also from the Seven Sins cake) and it was hands-down the best tasting cake I've ever made – friends and family were raving! Your recipes are my absolute favorite and I come to your site time and again for special occasions. Thank you, thank you, thank you! 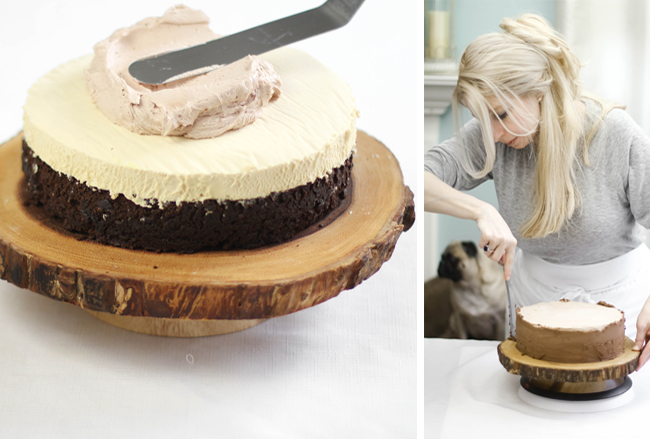 Wow, what a great idea to use the whiskey pastry cream and frosting from the 7S cake! I'll have to try your version - sounds exceptional! Thanks for the kindness, too. I needed it today. It seems unnecessary to freeze the mousse and then turn it out onto the cake, and nearly impossible if you only have 1 springform! Is there a reason you couldn't bake the cake in the springform, then pour mousse on top and chill thoroughly before frosting? I have a 10"+ springform, so there should be plenty of volume available for cake+mousse. The mousse is slightly more lax than a thick mousse that piles on top of itself when poured out, so it might seep between the cake and pan edge. The sides of a cake usually pull away from the sides of the pan during cooling. If you don't mind risking that, then I say go for it! I don't know if you'll see this comment, but do you think this would work with dark chocolate instead of white chocolate in the mousse?